I’m Tom Gates and I'm VERY excited to tell you about my FIRST EVER LIVE STAGE SHOW! It stars me (obviously), Amy Porter (who's smart), my best friend Derek and our band DOGZOMBIES. It's SO BRILLIANT that even moany Marcus Meldrew will enjoy this BRAND NEW story that's never been told before! I will be doing everything possible not to get into trouble and they'll be loads of doodling and caramel wafers (yum). I'll be annoying my grumpy sister Delia (time well spent) and the Fossils are bringing some food - but don't let that put you off. 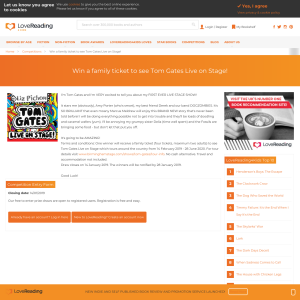 Terms and conditions: One winner will receive a family ticket (four tickets, maximum two adults) to see Tom Gates Live on Stage which tours around the country from 14 February 2019 - 28 June 2020. For tour details visit www.birminghamstage.com/shows/tom-gates/tour-info. No cash alternative. Travel and accommodation not included. Draw closes on 14 January 2019. The winners will be notified by 28 January 2019.